When conflict, rebellion, and resentment overwhelm their family, Charlie and Alice are forced to rethink their parenting strategy. In the process, they realize how critical intentionality and focus are when shaping and molding young lives. FamilyLife's first feature film explores the challenges and joys that come with raising children. Through a journey that unfolds over 50 years, Charlie and Alice discover the unmistakable power of family.Together, they learn that knowing and living by God's Word is what brings transformation and hope to any family. 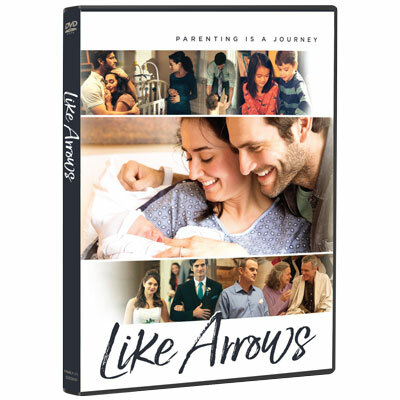 LIKE ARROWS casts a powerful vision for parents, reminding us that nothing is more important for any family than to have God and His Word directing our lives. Executive produced by Alex and Stephen Kendrick, and FamilyLife's Dennis and Barbara Rainey and Bob Lepine, the film is part of a significant new parenting initiative featuring FamilyLife's Art of Parenting™ , which includes an eight-session small group series. DVD includes bonus features including outtakes, director's commentary, and official music video. Includes English closed captioning; run time is 100 minutes. Prefer to stream? Visit our friends at ChristianCinema.com to purchase a digital copy.